At some stage or another during your visit to Bruny Island you’ll end up in Adventure Bay. Not only is most of the accommodation here, but also the hugely popular Bruny Island Cruises depart at the eastern end of the bay. 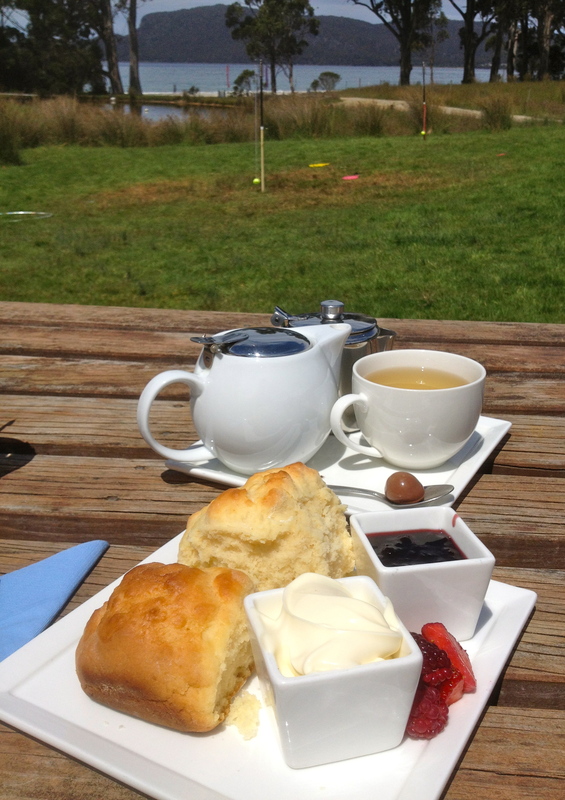 Well worth a stop is Bruny Island Berry Farm, which is on the way into the settlement if you are coming from the north. There’s a bunch of berry inspired desserts and ice-cream available, and if you didn’t get your fix from the menu you can buy berries and other Tassie treats to take home. We nab a picnic bench in the garden facing the bay and enjoy the elusive sunshine. Watch the Tasmanian Native Hens wander about or watch out for other species of birds around the dam. The Devonshire Tea gets five-out-of-five for presentation, it looks great, and with extras like fresh berries and a chocolate, it’s hard to know where to start. The scones look fluffy but end up being a bit dry, probably ideal earlier in the day. The blackberry jam is rich and flavoursome and accompanied with the double thick cream, it’s a winner. Tea: A small selection of Tasmanian ‘Art of Tea’ loose-leaf teas available. If you’re heading to the most southern road in Tasmania, you’ll pass through the small town of Franklin on the Huon Highway. Nestled near the Huon River and surrounded by apple trees it is rich in boat building history. If passing through, the Petty Sessions Cafe and Gallery is unmissable. Set in the lovely old renovated former Franklin Court, and a stone’s throw from the Huon River, the cafe has a large outdoor seating area on the deck with cosy corners and a small gallery inside for cooler weather. The scones look great. They’re wholesome rather than light with a more savoury than sweet taste which are crispy on the outside and fluffy on the inside. The home-style raspberry jam is bursting with flavour and the double thick cream is perfectly rich. Considering the size of the scones, the quantity of jam and cream falls far short of what’s needed. It’s a great excuse for a break and if you are into antiques, have a look at the shop in the old bank come hospital down the road. Tea: Some loose-leaf and tea bag varieties served in a small pot. Overall: A gorgeous historic building by the Huon River. I am surprised to find the Ida Bay Railway operating on Christmas Day, with the owners doing business as usual while entertaining friends in the cafe for Christmas lunch. Situated at the Lune River Station, Meg’s Cafe sits adjacent to the little railway station that runs two hour return trips to Deep Hole, a beautiful white sandy beach and picnic area, on Australia’s last operating bush tramway that also doubles up as Australia’s most southern railway. It’s a quaint experience and popular even on Christmas day! I grab a Devonshire Tea before heading out on the train. The bit-size scones come out of the freezer and in to the microwave but are unbelievably good. There’s plenty of plum jam and freshly whipped cream to go around and the cute teapot and teacup and saucer makes me feel like I am visiting family. Tea: A selection of tea bags served in a good-sized pot. Overall: Quaint, just like you’re visiting grandma. Who knew there were gigantic trees in Tasmania? The Swamp Gums are massive! Visiting the Tahune AirWalk, about a 90-minute drive southwest of Hobart, takes you deep into the southern forests near Hartz Mountain National Park and the Southwest Wilderness. The treetop walk takes you up-close-and-personal with the canopies of these giant gums with the AirWalk hanging over the Huon River offering amazing views of the Hartz Mountains and the surrounding forests. The forest circuit takes you along the forest floor and across a couple of swing bridges to or from the Visitors Centre and is a good way to work up an appetite. The on site cafe has lots of indoor and outdoor seating and is a good choice if you didn’t bring anything with you for a picnic. 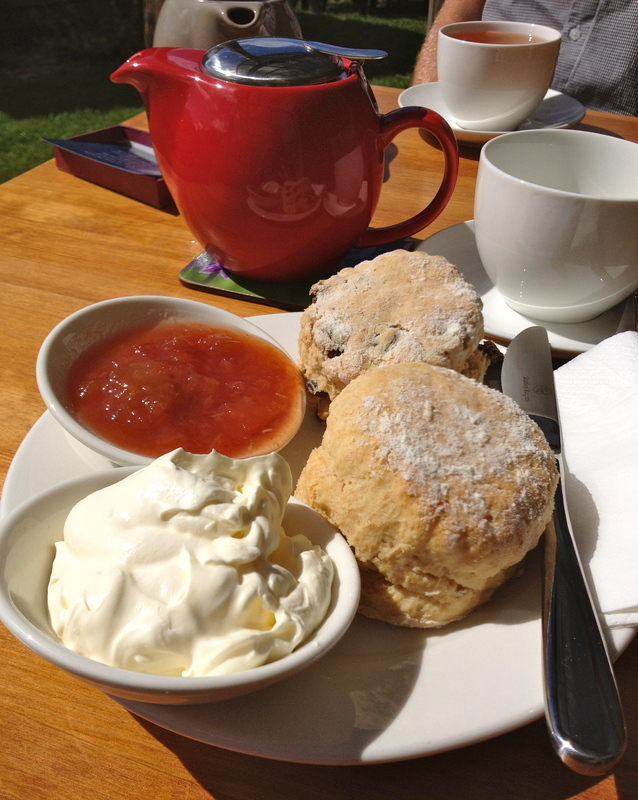 The Devonshire Teas aren’t the greatest, especially in a State that has the highest availability of scones in cafes that I have seen in Australia! The scones are warm and if fresh would have been very good. The raspberry jam is average and good enough, but the cream is a bit too light and airy. The place is well worth a visit though. Tea: A limited range of tea in tea bags served in a small pot. Overall: A great place to be surrounded by nature. Just 6km south of the tranquil town of Dover, Thelma Retreat and Wholefood Teahouse is tucked away down a long road servicing a number of large properties. It’s Boxing Day and we’re in luck that it’s open, and although we are the only guests we are welcomed into the sunny cafe surrounded by a well tendered floral garden and a friendly dog. The retreat and cafe are on a hobby farm with the cafe only opening a few months before. 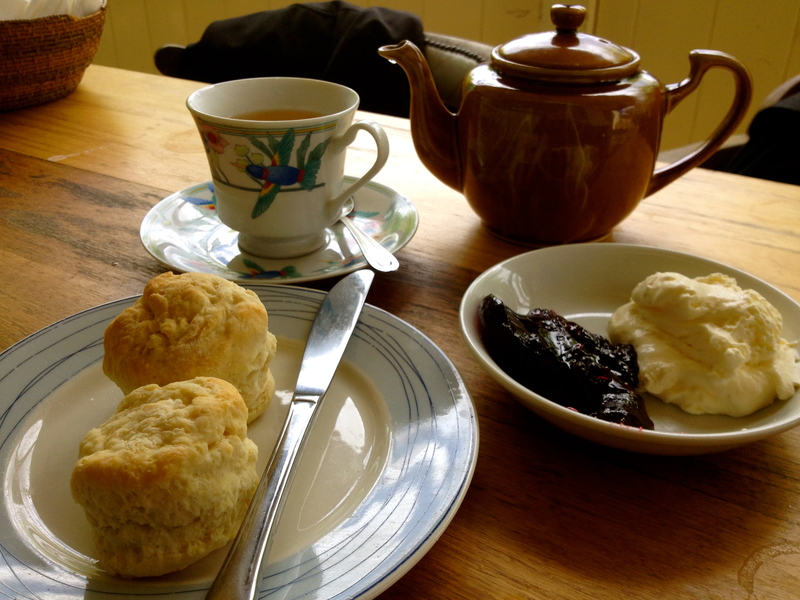 The flour used in the scones is ground on the premises and only organic herbal teas and coffee are served. The wholemeal and sultana scones are fresh and have an earthy wholesome taste, although they could be warmer. The nectarine and lemon jam is made with fruit from the garden which is a big plus as I love fresh tasty jam over synthetic sickly sweet ones. The fresh cream is whipped to perfection, rich and thick. What a lovely spot away from everything to enjoy the fresh country air. Be aware though, your meal arrives with a message from Jesus – food with religious thought. Tea: A choice of organic loose-leaf teas. Overall: A pretty garden setting and wholesome food. You’ll want to stop at the Margate Train just to see why a train is sitting by the side of the road. Built in 1955 and used between Hobart and Wynyard as ‘The Tasman Limited’, the train remained in service until 1978. It’s not all about the train, as there’s a van selling fresh seafood, a cavernous antique warehouse, and a British style sweet shop occupies the front carriages. The Pancake Train Restaurant is located in the original dining carriage and is a quirky place to enjoy refreshments along the Huon Trail. The scones are a bit cakey, rather than scone-like, and the raspberry jam and cream aren’t bad at all. It’s a fun stop if you’ve got some time to spare. Tea: A limited variety of loose-leaf teas, and herbal tea drinkers may be a bit limited. Overall: A quirky experience dining in a 1955-built train dining carriage. Thanks for this blog, it was very helpful for our Tassie trip. Glad to hear that it’s of use! The main reason why I started collecting and collating is that I found it sometimes difficult to just locate places with scones! 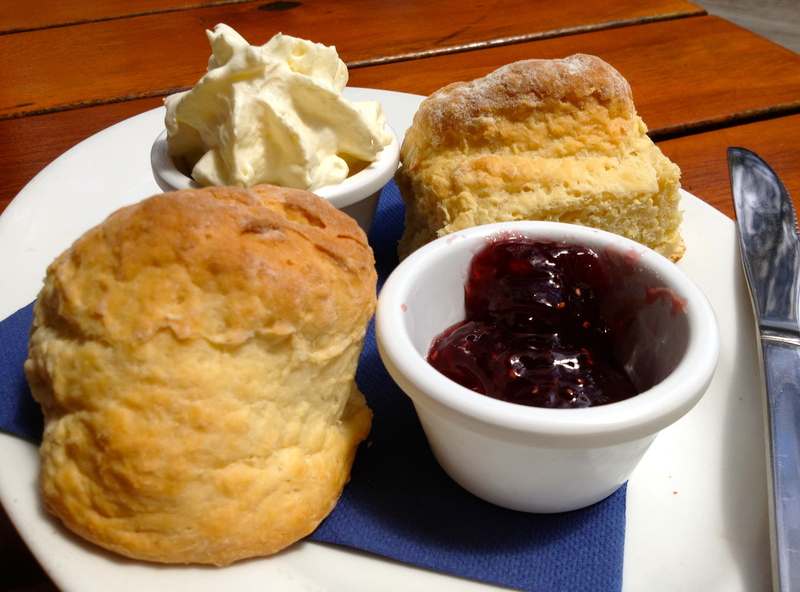 PS Tassie is great for scones. I still have an arms length list of places to try when I go back! Oops! Thanks Peter! Much appreciated. And yes, no excuse for a bad scone, but there are so many out there! 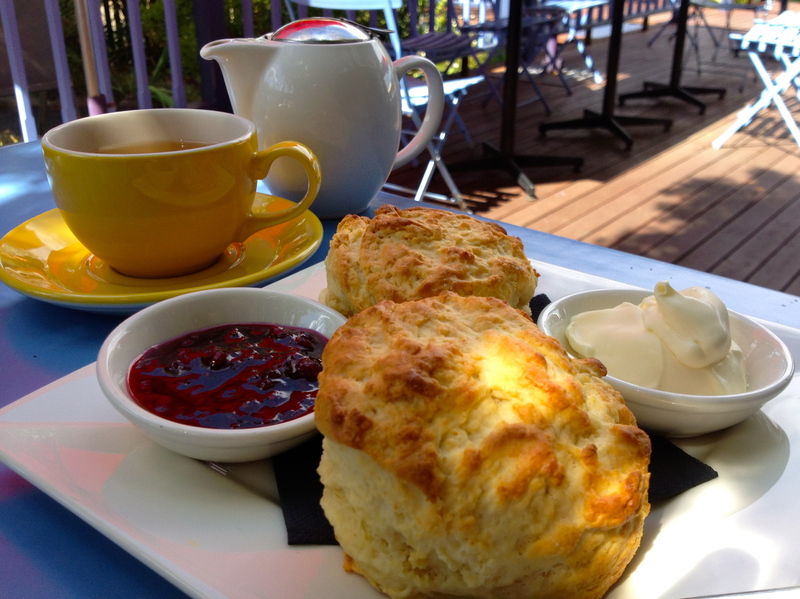 We have the shot tower at Taroona and have been asked by customer to be added to your Devonshire tea guide. Thanks for your email. The Devonshire Tea Guide is a hobby of mine, and I generally write about my Devonshire Tea experiences that I sought out on my travels. 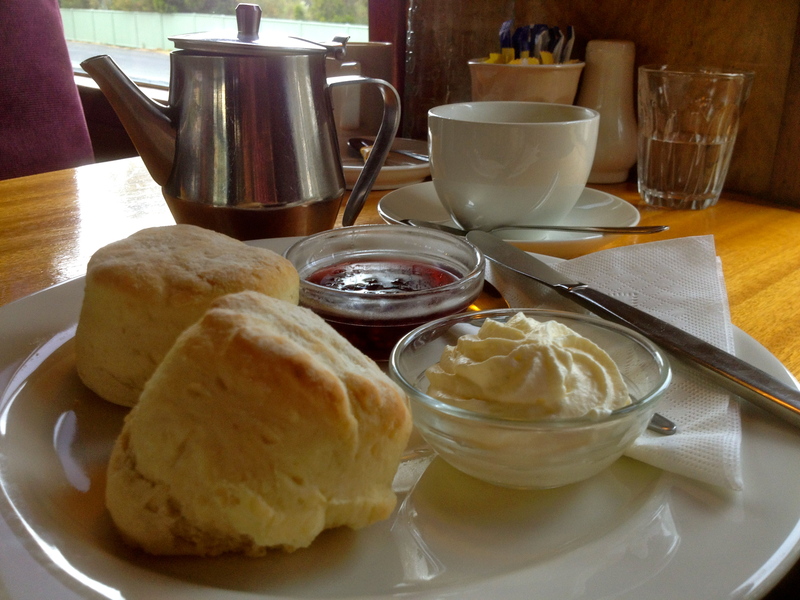 I have a long list of scones to try in Hobart and Huon Valley that I missed out on my last visit. Maybe I’ll add a list of places that serve Devonshire Teas. i.e., ones I haven’t reviewed on the blog. If so,I’ll definitely add you too it, but hopefully I’ll be able to get down your way soon.